Taken from the grade book of a teacher who is breaking protocol by issuing his grades before his analysis, here is the Pittsburgh Steelers Report Card for the 52-21 win over the Carolina Panthers. Ben Roethlisberger was only hit twice and sacked only once. For most of the night, Ben had time to write his dairy in the pocket. The Steelers weren’t quite as effective running the ball as they have been, but they didn’t need to be. Chris Boswell was 5 for 5 on extra points, and made a 50 yarder into the open end of Heinz Field. Ryan Switzer had one nice punt return and, for the first time in recent memory, neither the Steelers coverage nor return units gave up a penalty. Special team’s shining moment came on Roosevelt Nix’s forced fumble and Anthony Chickillo’s recovery. 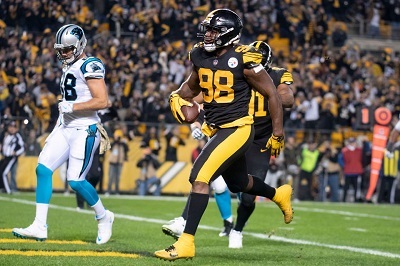 The last time the Steelers played at night, it looked to be lights out in Pittsburgh, but the win over the Panthers illustrated the dramatic difference the team has experienced since then. It is now time to give the Haley haters their day. Under Randy Fichtner, the Steelers offense is firing on all cylinders in ways it never did under Todd Haley. 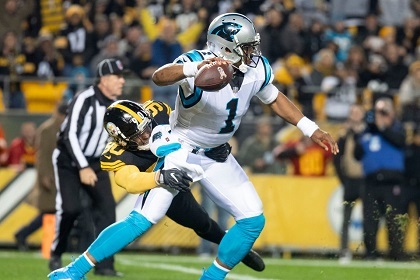 The Steelers offense was multi-faceted against the Panthers, burning Carolina for long touchdowns, converting third downs, orchestrating long, clock-consuming drives all while mounting a balanced attack. The Steelers defense was also excellent. Perhaps had, the game evolved differently, the Panthers rushing success could have been the defense’s undoing. But that is an academic question, because Keith Butler‘s boys limited the long ball and harassed Cam Newton through the night. There is no shortage of candidates for this award but we’ll focus on one whose stat line says he ‘only” made one tackle. One tackle, behind the line of scrimmage. This player corralled and wrapped up Cam Newton in the end zone, which forced a pick six. Later this player clobbered Cam Newton in a strip sack with a hit that shook up Carolina’s signal caller, and for that T.J. Watt wins the Unsung Hero Award for the win over the Panthers at Heinz Field. This entry was posted in Steelers 2018 Season, Steelers Report Card and tagged Anthony Chickillo, Antonio Brown, Ben Roethlisberger, Bud Dupree, Cameron Heyward, Chris Boswell, Coty Sensabaugh, Darrius Heyward-Bey, David DeCastro, James Conner, Javon Hargrave, Jaylen Samuels, Jesse James, Joe Haden, Jon Bostic, Joshua Dobbs, JuJu Smith-Schuster, Keith Butler, L.J. 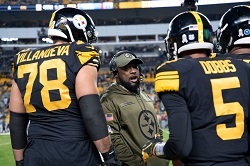 Fort, Maurkice Pouncey, Mike Hilton, Mike Tomlin, Morgan Burnett, Pittsburgh Steelers, Randy Fichtner, Roosevelt Nix, Ryan Switzer, Sean Davis, Steelers offensive line, Steelers report card, Steelers vs. Panthers, Stephon Tuitt, Stevan Ridley, T.J. Watt, Terrell Edmunds, Vance McDonald, Vince Williams. Bookmark the permalink. With Whipping of the Panthers, Are the Steelers the Contenders We Thought They Were?